MAME (Multiple Arcade Machine Emulator) is a computer program which runs on PCs which can emulate a huge number of arcade games (i.e. the ones where you put in quarters). In fact there are more than 5848 rom sets that can be played which would be worth $1,462.00 if you played each one once for a 25 cents each! 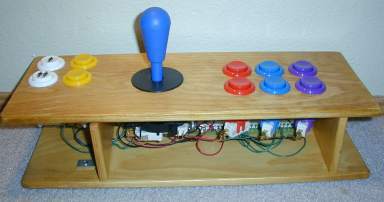 This guy built a MAME cabinet in about 24 hours. I'm salivating just looking at it. I might be able to build and identical one here for about R$1,350.00 (or USD$572.00) without the monitor and the computer (which I already have). Ever since I was a kid I had a dream of having a Robotron cabinet in my house, and now it could be possible, without even breaking the bank. Another idea is the image below, built by Joel McIntyre which is maybe a litte more practical, and cheaper too. I've been doing some digging and I found that the best version of MAME is AdvanceMame and the best front-end is AdvanceMenu. Basically the AdvanceMame tries to improve on the graphics and the internal menus are nicer. AdvanceMenu is very clean, and can use images of the games, which is great for my son who can't read yet. AdvanceMenu can also support ZSNES (nicest looking SNES emulator), and ePSXe (best looking PlayStation emulator). I only looked at emulators that also work in Linux so there may be some other ones out there that do a better job in Windows or DOS (ugh). UltiMarc.com for the cool joystics and connectors for the computer. ArcadeControls.com for more arcade projects. Mame.net points to the mame comunity. AdvanceMame which is extremely active (there was a new release today, 2005-12-27! ).